Alciato at Glasgow: Emblem: Inanis impetus. Et peragit cursus surda Diana suos. A dog at night is looking into the moon’s disk as into a mirror and seeing himself, thinks there is another dog there; and he barks - but the sound is carried away, ineffectual, on the winds. Diana, unhearing, pursues her course. 2. 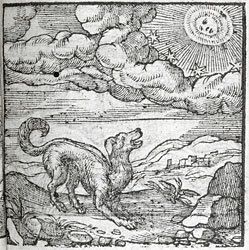 Variant reading, altum credit inesse canem, ‘thinks there is a dog up there’. 3. Diana is of course goddess of the moon.